Synopsis: A gardener in East L.A. struggles to keep his son away from gangs and immigration agents while trying to give him the opportunities he never had. Review: It’s not hard to see why there was a big grassroots effort to get Bichir an Oscar nomination for his role in A Better Life. It has all the makings of a performance that the Academy likes to take under its wing. I had heard buzz about a nomination for him being an upset so I wasn’t too shocked to see his name come up first when the Oscar noms were announced. 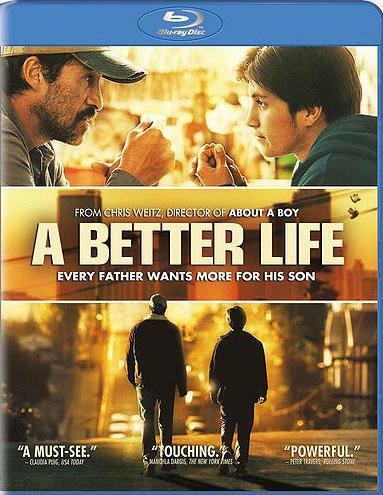 Of course A Better Life was one of two movies nominated for major awards that I hadn’t seen so I snagged a copy from Redbox and had a look. The results were disappointing to say the least. Bichir is good, don’t get me wrong, but how a nomination for him bested Michael Fassbender in Shame or Ryan Gosling in Drive (I would have even said Leo DiCaprio in J. Edgar was robbed…but that movie was so bland that I can’t blame the Academy for ignoring it) is beyond me. The performance of Birchir is the only noteworthy thing about this exceedingly ordinary film. I found it to be a pretty heavy handed affair that continually deluges the viewer with images meant to invoke sympathy. The problem with that is when the audience recognizes they are being manipulated to feel a certain way, sooner or later they will rebel against it. The immigration angle has been done to death in not only films like this but television news specials that are far better and more insightful. The muddled gang storyline is ripped straight from multiple shows on TNT or Law and Order and the “will he or won’t he join” question is asked and answered fairly quickly. The only arc that hooked me was the interaction between father and son…but even these fleeting scenes were presented in such a saccharine and Hallmark-y way that it took away from overall emotion intended. Director Weitz doesn’t like to be tied down in any genre…starting with American Pie and moving through About a Boy to The Golden Compass and Twilight: New Moon he clearly has some range of film scale. Here his film comes across as more of a Public Service Announcement about immigration and illegal aliens than it does about a father trying to get on track. Birchir’s performance is almost squelched by a lot of nonsense (and he’s not helped by Julián’s rote performance as his son) but he does his best work with no dialogue at all. Of the many obstacles he has to overcome, what he conjures up in his weathered face shines a bright light in a grey kind of movie. If you are an Oscar completist you either have seen or will see this film to check off having seen Birchir’s role…but to everyone else I’d say skip this. It’s nothing you haven’t seen before and there are more rewarding options out there. Don’t forget to vote in my weekly poll!